This upside-down holiday property boasts views from all angles and is ideally located in the North Yorkshire Moors. 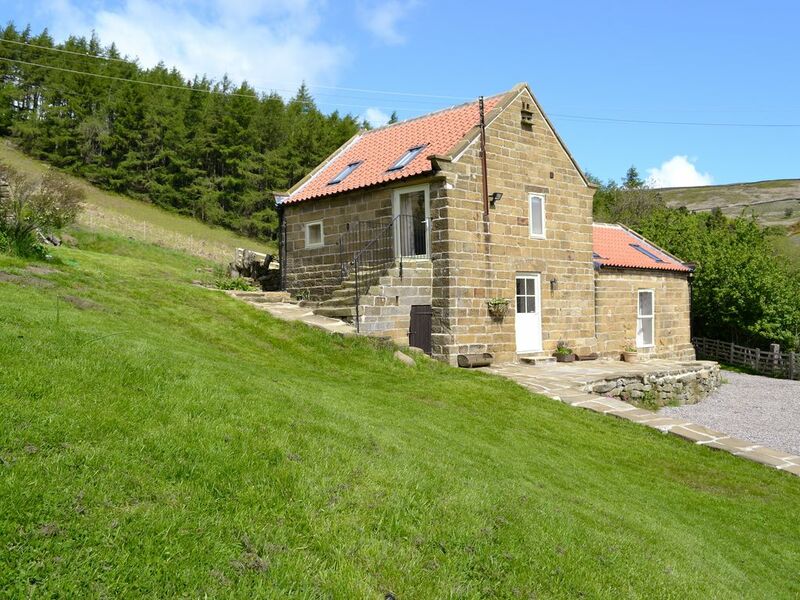 This detached, upside down holiday cottage is the perfect location for guests wishing to explore the lovely North Yorkshire countryside and is situated next to the owner’s farmhouse on a working hill farm looking out over beautiful Raisdale and Bilsdale. Wood Cottage, so named because it stands next to the gate leading to the wood, is a renovated 200 year old barn. The farmstead is nestled between the hills, a stone’s throw from the Moor and has been in the same farming family for four generations. Previously used to house livestock, the barn has been lovingly restored to make delightful living accommodation. It is decorated throughout with great attention to detail to a very good standard providing a comfortable, spacious and modern living space whilst retaining original features. The beautiful fabrics and furnishings have been carefully selected to keep the cottage light and pretty. The living/dining room/kitchen is upstairs to take advantage of the fabulous views of the surrounding countryside. There are also roof lights that allow light to flow throughout. Outside, the garden, which has both a paved area and a lawn, is surrounded by magnificent scenery and enjoys views across the open countryside which includes a field barn; the only one in the area, and the stone-walled fields so typical of the farmland hereabouts. A short walk in any direction provides a site for a picnic; making this the ideal base for a family holiday, romantic break, get together with friends or just the chance to unwind and get away from it all. Wood Cottage is ideal for walkers, and cyclists with several established public footpaths, cycle paths and bridleways that pass through the owner’s land enabling guests to explore and enjoy some of the most fabulous countryside leading through woodland, fields, hills and dales, over towards the Wainstones and beyond. Located on the edge of the North Yorkshire Moors and the Cleveland Hills, Chop Gate itself offers a pub that serves local food and drink and is within ½ mile. For guests wanting to travel a little further, the village of Great Broughton is 4 miles away and offers several local pubs with restaurants, a small village shop and post office. Just 7 miles away, guests can visit the town of Stokesley, which offers a traditional high street lined with restaurants, various shops including supermarkets and a weekly market. There is also an excellent leisure centre with a public pool, gym and other great facilities, and a 9-hole golf course with driving range and crazy golf. A little further afield, but within an easy 15 mile radius, guests must visit the local market towns of Helmsley, Guisborough, Northallerton and Yarm which are all renowned for their bustling high streets. Nearby attractions include Great Ayton, many National Trust properties, Captain Cook’s Monument, Roseberry Topping, Flamingo Land, Castle Howard and the historic city of York. Guests will also find that a trip to the coast is an easy drive and takes approximately an hour to reach the fabulous sandy beaches that scatter the area or take a steam train from Pickering, 45 minutes’ drive away, to Whitby on the North York Moors Railway. Shop 4 miles, pub and restaurant ½ mile. Open plan living space: With tiled and wooden floor. Electric central heating, electricity, bed linen and towels included. Travel cot, highchair and stairgate. Welcome pack. Small garden with patio, terrace, garden furniture and barbecue. Shared 200-acre grounds. Bike store. Private parking for 2 cars. Please note: The property has a natural water supply from a spring and there is a stream nearby. There are 7 steps to the entrance of this property. This property is situated on a working farm, and the owner lives next door. There is a stream nearby and this property has a natural water supply from this spring. Access to the property is by rough track. There is a pond in the grounds of the cottage, accessed through a gate and down a slope.